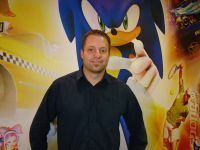 Miles Holmes is a passionate game designer with 18 years of experience working on acclaimed franchises such as Sega’s Sonic the Hedgehog, Full Auto and EA Bioware’s Mass Effect. Miles is also a table-top geek and has design articles published with Games Workshop, Privateer Press, and most recently, Twilight Creation's Zombies!!! His painted miniatures have been featured in books and magazines, and he has numerous tournament awards including the Games Workshop 1999 world staff champion for Warhammer 40,000. As well, Miles is a published sci-fi author in Privateer Press' Skull Island Expeditions series. His current project, a tabletop strategy game called Road/Kill Ultimate Car Combat will debut on Kickstarter May 31 2013.